As Richemont’s mid-range luxury watch brand, Baume & Mercier has enjoyed success over the years. They are best known for their quality Swiss Made products with stylish, restrained designs at affordable prices. For 2017, the brand has updated their popular men’s Clifton series to now include the sportier Clifton Club. Positioned as timepieces created for the “gentlesportsman,” this series represents Baume & Mercier’s rare foray into sports watches. As a premier used watch dealer, Gray & Sons stocks a wide range of used watches for sale online, including Baume & Mercier and other fine brands. Don’t miss our inventory of pre-owned high-end timepieces at more affordable prices. 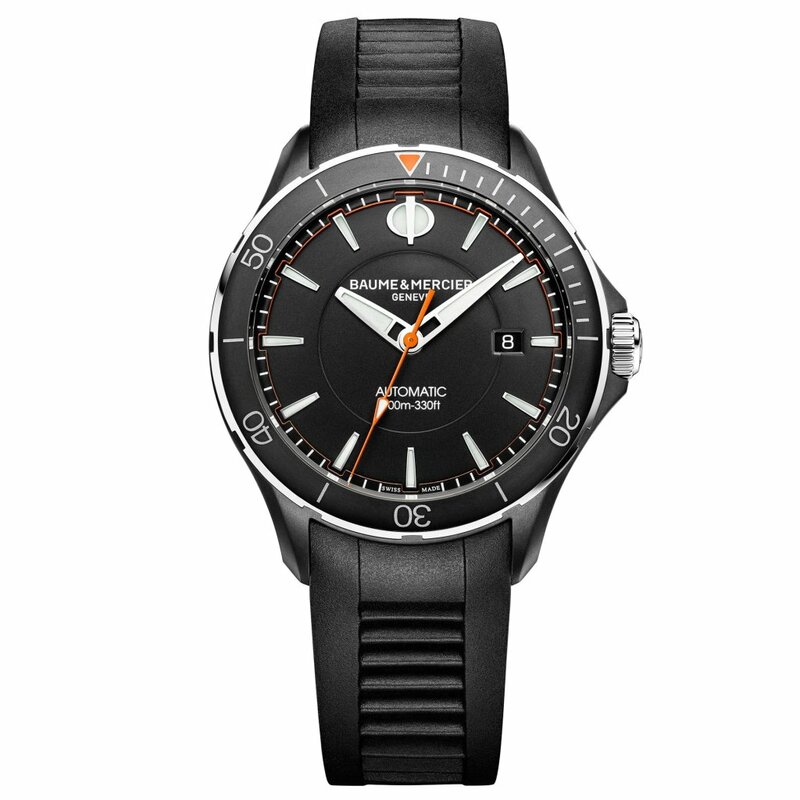 Inspired by fair play, sporting elegance, and the beauty of movement in all sports, Baume & Mercier has conceived a multifunctional sports watch with a distinctive look that would look just as good on the court or in the conference room. Taking their cue from the Latin saying, “Anima sana in corpore sano”—which translates to, “a healthy mind in a healthy body”—the Swiss watch brand is harking back to the professionals who produced the powerful vision of sport that emerged at the turn of last century. Unveiled during SIHH 2017, the Clifton Club collection comprises five models of similar design, but with different color options and strap offerings. Made from stainless steel, all watches sport cases with a generous 42mm diameter. The first two versions include stainless steel bracelets with a choice of an all black dial and bezel combo or an all blue dial and bezel combo. 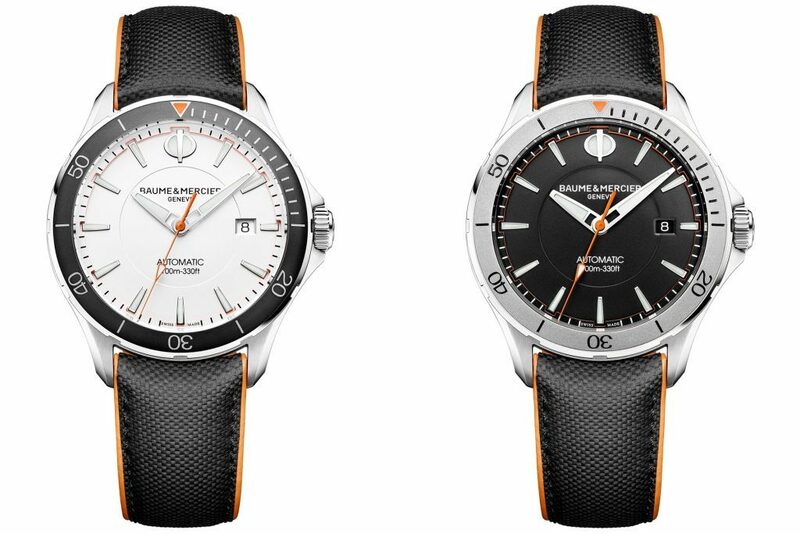 The next two Clifton Club models are outfitted with Baume & Mercier’s exclusive “All Road” black calfskin leather strap. The choice here is between a black dial and steel bezel configuration or a white dial and black bezel one. The fifth and final model boasts a black sandblasted case with ADLC (amorphous diamond-like carbon) finish and a matching black dial and bezel. 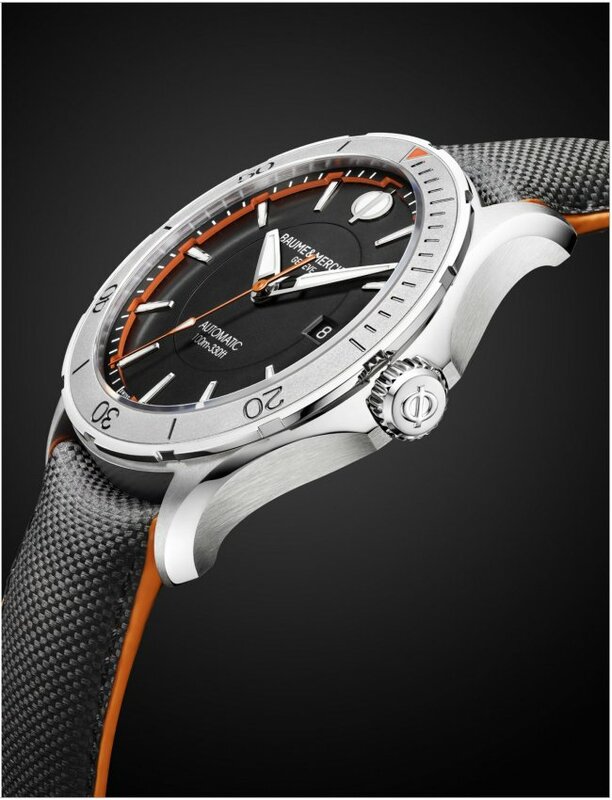 The vulcanized rubber strap further enhances the sportiness of this particular Clifton Club. All watches in the collection contain a pop of orange on the bezel and dial, while some also incorporate orange highlights on the watchstrap. Each Clifton Club models includes an easy-to-handle unidirectional, engraved knurled steel bezel. Ensuring resistance to degradation over time, the bezel’s numerals are filled by hand with long-lasting lacquer. The Clifton Club collection’s watches also have integrated curved lugs designed to enable a comfortable merging of the case and strap. Furthermore, topping off the case’s athletic shape is an integrated crown cover with a large screw-down crown. This strategically designed crown allows for quick adjustment of the date and time, as a result of its stop-second system. Designed to be suited to all forms of sport, including watersports, the series is water-resistant to 100 meters. With a nod to Geneva’s watchmaking traditions, all finishes in the Clifton Club collection are completed by hand. The collection’s bevels, for instance, are sandblasted in the center and polished on the edges, while steel bracelets are vertically satin-finished. Created to withstand rigorous activity, the Clifton Club’s dials contain a protective Zapon varnish, which offers resistance to oxidation while facilitating the capture of light to enable optimal legibility regardless of time of day. The dial is equipped with an antiglare, scratch-resistant flat sapphire crystal. The date window at 3 o’clock displays either a black or white date disc, depending on the dial color. Adding a subtle detail to the watch’s face, the dial’s outer periphery has an orange-varnished thin inner band. The riveted white indexes and Baume & Mercier’s “Phi” logo at 12 o’clock are filled with Superluminova guaranteeing readability both day and night. Maintaining a harmonious design, the timepiece’s hour and minute hands are also finished off with Superluminova, while the narrow second hand boasts an orange varnish and is tipped with a touch of the luminescence. Powered by the mechanical self-winding Sellita SW200 movement, the wearer can rely on the watch’s proven reliability even in the face of stressful factors. In fact, the movement is tested for shock resistance to 550 G. Offering hours, minutes, seconds, and date functionality, the Clifton Clubs have a frequency of 4 Hz or 28,800 beats per hour and a 48-hour power reserve. Continuing the rugged design of the Clifton Club collection, Baume & Mercier have rounded off these watches with a stainless steel screw-down caseback. The casebacks display a coat of arms, the word “Club,” and again the brand’s “Phi” logo. This engraving is reminiscent of a private members’ club card and represents such noble values as camaraderie, generosity, courage, fair play, and team spirit — the principles associated with Baume & Mercier’s idea of sport. Contemporary, high-performance timepieces, the Clifton Club collection is available in a range of very affordable prices. 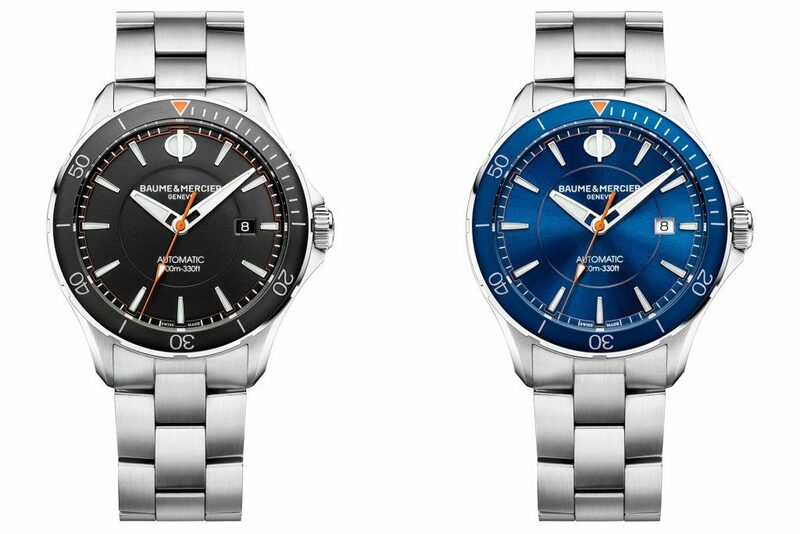 Considering their high-quality, fresh designs, and exacting standards, these moderately-priced Baume & Mercier watches are a solid choice that won’t break the bank. For even lower prices and greater choices, browse our inventory of used Baume & Mercier watches. We are one of the country’s best companies that specialize in used watches for sale online. While Gray & Sons is a pre-owned watch dealer based in Miami, we do ship to all 50 states and select overseas countries. See our secondhand Baume & Mercier Hampton watches, pre-owned Baume & Mercier Classima timepieces, like-new Baume & Mercier Capeland models, and others, HERE.